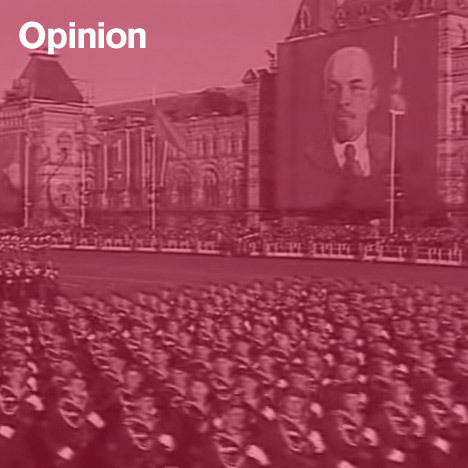 Opinion: Stalinist Russia turned its military parades into architecture, creating a peculiar form of pomp that still resonates in modern Moscow and emphasises the city's inequalities, finds Owen Hatherley. The parades of Stalinist regimes saw people become architecture, marshalled into patterns, organised in urban space in alignment with symbolic buildings. In May, I was lucky enough to witness one of them being rehearsed. The roads on the central Moscow boulevard of Tverskaya were suddenly closed off to pedestrians and traffic, and the pavements became full of spectators. Then came the tanks, the missile launchers, the armoured cars, the rockets, rumbling past the chain coffee concessions. In front of them was a line of plastic portaloos, as if this was a music festival. This was the dress rehearsal for the Parade for the 70th Anniversary of the Victory in the Great Patriotic War. In honour of it, the streets – the boutiques, chain stores, staggeringly overpriced restaurants, oligarch's residences and luxury hotels – of one of the most unequal cities on the planet were bedecked with red flags and the hammer and sickle. Given that Russia is currently fighting a real, albeit low-level war against its fellow former Soviet republic, Ukraine, it's hard to see it as ironic. It's certainly a long way from the evocation of wartime memory in, say, Britain. The wearing of paper poppies on Remembrance Day – evoking the flowers that grew on the devastated fields of Flanders after the First World War – is about memory, and the St George's Ribbon, the Soviet and Russian equivalent, is about victory. The wearing of the poppy can still be nationalistic, as anyone who saw the spectacular, mass-ornamental sea of poppies in front of the Tower of London last year can attest – and 'our boys' in Afghanistan are never far away – but the difference was intended. In Molotov Remembers, Stalin's second-in-command Vyacheslav Molotov pointed out that the Soviet approach to war commemoration was deliberately divisive. War memorials were not to be monuments of remembrance, but monuments to military glory. The notion of a Tomb of the Unknown Soldier was rejected by Molotov in favour of a Tomb of the Unknown Anti-Fascist – to suggest all soldiers fighting in the war were equal was "petit bourgeois sentimentality". Given what the Soviet Union suffered in the war at the hands of Germany and its allies, the obnoxious Molotov did have a point. Outside the former USSR, few comprehend the scale of the war of extermination fought in the East – current estimates of the number of Soviet citizens killed hover between 26 and 27 million, with Belarus, Ukraine and western Russia utterly destroyed. Civilians made up the majority of victims. Remembering the victory in such circumstances is obviously different than it is in the UK, France or the US – and the commonplace bickering about Stalin's earlier appeasement of Hitler (as if the Munich Agreement never happened) is, given what the Nazis unleashed upon the Soviets, faintly offensive. Yet even before the war, Stalin's capital was remade for the purposes of militaristic parades. Tverskaya was, before 1934, an ordinary, slightly small-town street. Demonstrations had long passed down its sloping curve to Red Square, which made it the natural choice for rebuilding to emphasise a bombastic conception of "glory". The street's main architect, Arkady Mordvinov, widened it by three times, demolished more than half its pre-1930s buildings, and replaced them with an architecture of multiple storeys, ornamental skylines, grand archways (usually leading to two-storey streets) and spectacular framing effects. The entrance gates to Red Square were demolished, so that the parades would have a clear path. Earlier buildings – such as the 18th-century palazzo that housed the Moscow City Council – were often not demolished but hoisted above new extensions below, meaning that the street looked "historic" in detail while being dementedly overscaled in form. Post-war additions, like the spiky pinnacles of Dmitri Chechulin's Hotel Peking, added skyscraping height to the already yawning width of the street. Renamed Gorky Street in 1935, this street, or "Magistrale", with its emphasis on effects, bastardised historical detail, contradictions and thin but captivating facades, was Postmodernism before the fact – an architecture parlante of surface and declaration, set both against Modernism and "straight" Neo-Classicism. Parades of workers, sportsmen and women, then increasingly tanks, missiles and such, passed through a wide empty space to Red Square. Here, the ensemble of the Byzantine-Gothic towers of the Kremlin, the neo-Russian spires of the GUM department store and the fantastical St Basil's Cathedral – commissioned after the victory over the Tatars of Kazan by Ivan the Terrible – was augmented with Alexey Shchusev's Lenin Mausoleum, the third and final version of which, finished in 1930, was in a neo-Sumerian pyramid in red marble and black granite. Literally over Lenin's dead body, Stalin and his cronies would salute the parades. This spectacle of power was an inversion of the socialist city as it was conceived in the first decade after the 1917 revolution – open, anti-hierarchical, decentralised – but it was exported to Berlin, Warsaw and Beijing after the war. Under Brezhnev, parades on Victory Day became a regular occasion, as the Politburo on top of the Mausoleum became ever more geriatric. To see this spectacle continuing is a bit of a shock, to be sure. Although the route was complicated by the rebuilding of Red Square's gates in the 1990s, and although a couple of the renamed Tverskaya's buildings are now actual rather than proto-Postmodernist, the spectacle must be similar to that which was experienced in the Brezhnev era; and so, from the look of some of the hardware, are many of the tanks. It's also very popular – even for the rehearsal, the streets were packed out with wearers of the St George's Ribbon. It all seems designed to support the notion that Vladimir Putin's Russia is on a neo-Stalinist trajectory, as displayed by its aggression against Ukraine; some of the Victory tat on sale evokes this, grossly equating the USSR's defeat of Nazi Germany with the Russian Federation's bullying of its economically crippled neighbour. Nonetheless, the luxuriousness and expense of the street down which the tanks trundle speaks of just how "Communist" the current Russian regime really is. A couple of miles from the parade, in the Museum of the Great Patriotic War, you will find an actual Hall of Memory – not Glory – which would have horrified Molotov. Designed by the Soviet sculptor Lev Kerbel, it consists of 27 million illuminated threads dangling from the ceiling in a dark passageway, leading to a hulking mother cradling a soldier. It's deeply Soviet in its egalitarianism, muscularity and scale, but as moving as any of the abstracted memorials of the West. Perhaps mourning rather than vainglory wasn't so petit-bourgeois after all. Owen Hatherley is a critic and author, focusing on architecture, politics and culture. His books include Militant Modernism (2009), A Guide to the New Ruins of Great Britain (2010), and A New Kind of Bleak: Journeys Through urban Britain (2012). His latest title, Landscapes of Communism: a History Through Buildings, is released by Allen Lane on 4 June.